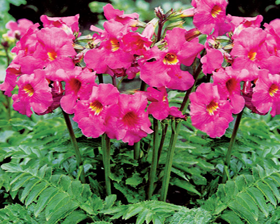 This plant features large, bright-pink trumpet flowers, similar in effect to a Gloxinia. Deeply-cut green foliage appears at the base, with stems rising higher bearing clusters of blossoms. Features clusters of trumpet-shaped, pinkish-red, 6cm long flowers with yellow throats (5-12 flowers per cluster). Excellent for cutting. Height 45-60 cm. Sow Hardy Gloxinia seeds indoors 10 - 12 weeks before planting outdoors. The flower seed benefits from light, so cover the Incarvillea seeds very lightly. Transplant the Incarvillea seedlings outdoors when it has at least 2 sets of true leaves. Hardy Gloxinia care includes regular watering and deadheading the spent blooms to encourage continued flowering.